A hero is only as good as his villains. This goes some way to explaining why Batman is so successful but Superman seems to struggle. Spider-Man benefits from this as well but one of his most iconic villains didn’t make the initial transfer to the big screen successfully. Venom was part of Sam Raimi’s ill-fated Spider-Man 3 and the character became lost in the shuffle. Now in the age of expanded and extended universes, the best anti-hero in Marvel comics has his own film, bypassing any links to the more famous web-slinger at all. 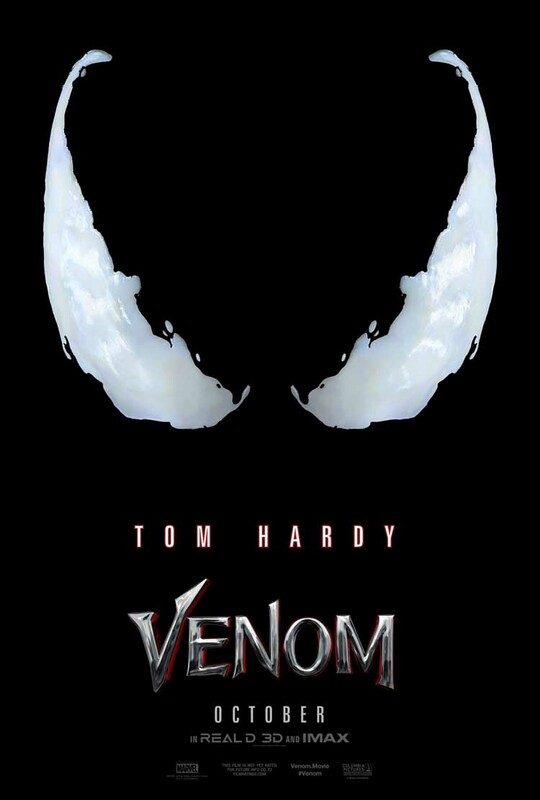 At first glance, Venom seems to be bringing something different to the over-saturated superhero market. Although the film never goes as far as an R-Rated movie, Venom certainly pushes the limits of it’s PG-13 rating. In bringing the darker character to the screen, Venom includes bad language, some extreme violence and some fairly freaky body-horror and scarier elements you wouldn’t expect from a standard superhero movie. Venom is not a standard superhero movie though. He is a villain and if they had gone down the route of pitting him against Spider-Man from the beginning, he would have been marketed as such. Instead, here he is an anti-hero, struggling to toe the line between good and evil. It adds an interesting dynamic to the character and requires a very good actor to help play the two parts of the conflicted characters against each other. Tom Hardy is a great fit here. He is having a lot of fun and shedding the more serious persona that he has become synonymous with. Hardy plays a consummate loser. A moral crusader who’s actions lead to him losing everything. Once the Venom suit attaches though, he gets intoxicating, unstoppable power and his “superhero” transformation becomes complete. 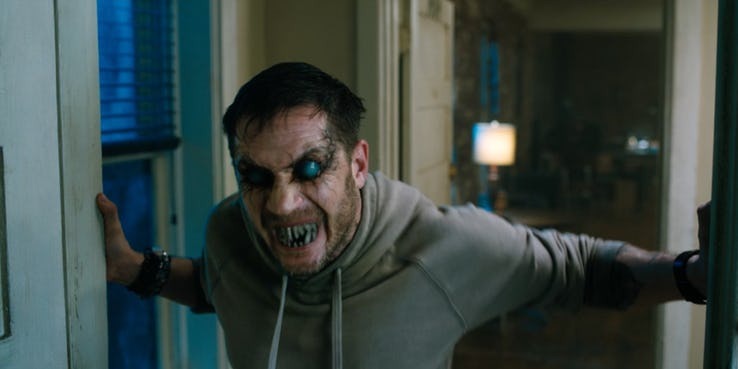 Those initial scenes where Hardy and his “inner-demon” are competing with each other are some of the best of the film. Venom calls the shots but Hardy’s Eddie Brock gives as good as he can, trying to keep his new, darker alter-ego on the lighter side of the battle. It also means that the first few set-pieces and action sequences have a more unique element to them as we see Venom saving Brock from the faceless thugs trying to do him harm. Unfortunately, none of these unique elements are enough to stop Venom falling into the same superhero origin movie traps. Strip away what makes Venom the character unique, and you have the same beats that Marvel, and many other superhero movies, have been relying on for years. Brock will be out of his depth, lose his confidence and regain his abilities. He will be involved with an out-of-reach love interest (a strangely cast Michelle Williams) and eventually face a villain who is exactly matched to his new found super-powers. In this case, that villain is a wasted Riz Ahmed. Ahmed’s story-arc is nothing new and he becomes yet another paint-by-numbers villain that serves the purpose of punching the hero really hard rather than any story of actual depth. In fact, the finale becomes a CGI slug-fest which unfortunately pulls any actual heart out of the movie when the central characters has so much potential and key elements to develop. This leaves Venom as another example of a superhero who will benefit from the sequel. Now that the character has been established, the freedom of a more original story can be told. With the mid-credit scene being used to fantastic effect with a great piece of foreshadowing, the real excitement is with what potential Venom 2 could bring. Overall, Venom is a great version of a character given a poor deal in a previous movie. Tom Hardy brings him to life brilliantly and some of the more complex aspects of the “superhero” are explored. However, underneath a thin veil, this is yet another standard superhero origin movie and although done well, offers nothing original enough.